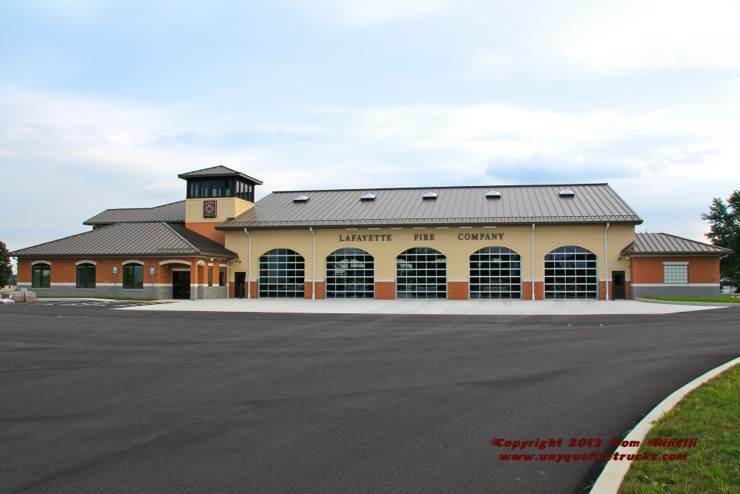 Occupied in the Spring of 2012, Station 63 features five drive thru bays, gear storage for 68 members and a dedicated area for the company’s antique rig. It replaced a 1975 station that featured two 100’ deep bays which allowed “stacking” of their five front line apparatus as well as the antique rig. Foam Engine 6-3-2 - 1978/1992 Mack/PA Fire Apparatus 1500 gpm/500 gal. When purchased new as a canopy cab, it was the company’s first apparatus with jumpseats. 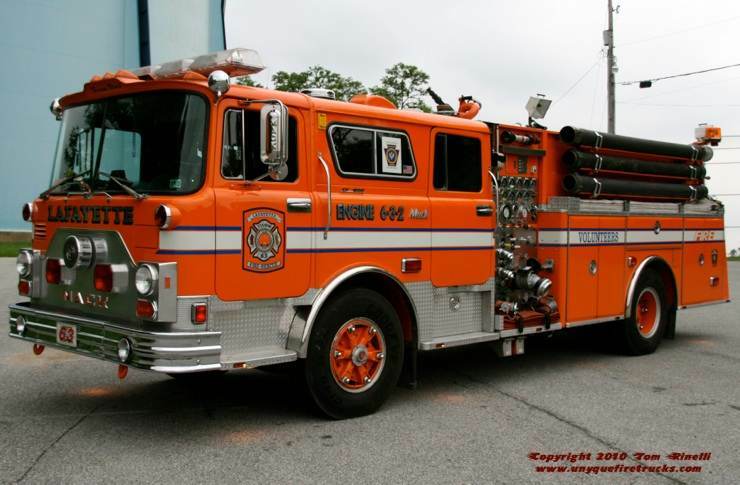 In 1991, in anticipation of being converted to the foam unit, it was sent out for a year-long rehab complete with a four door cab enclosure, a new body with larger hosebed and recertification of the pump. Responding as part of the countywide foam task force, it features an Akron foam system, 410 gallons of Universal Gold AFFF, 1,400’ of 5” LDH supply line, 1000’ of 1 3/4” attack line, haz-mat spill containment and decontamination supplies. Chartered in 1943, the company was named in honor of General Lafayette who in 1825 staged his troops along the current Old Philadelphia Pike (Route 340) prior to marching on Lancaster. Serving East Lampeter Township bordering the east side of the City of Lancaster, Lafayette protects a mix of residential & commercial occupancies. Twenty five active volunteers respond to approximately 500-600 alarms annually providing Fire, Extrication & Technical Rescue services. Engine 6-3-3 - 2003 Pierce Quantum 2250 gpm/500 gal. The busiest unit in the station responding first due to fire calls, it is equipped with one of the largest pumps in Lancaster County (both of which are in the same township). It is equipped with a total of 11 pre-connects, 1,000’ of 5” LDH, a 15kw generator, thermal imager, RIT Pack & an AED. 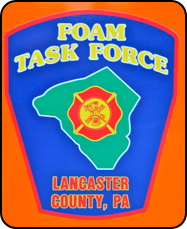 As part of the county foam task force, it carries 80 gallons of Universal Gold AFFF & 50 gallons of hi-expansion foam. Rescue Engine 6-3-1 - 2003 Pierce Dash 1500 gpm/500 gal. 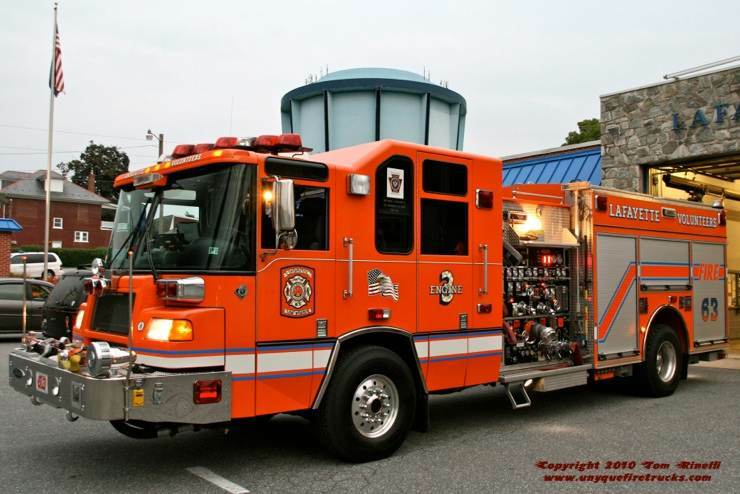 Entering service in 2009 after an in-house rehab, this rig previously served Riviera Beach (MD) as the infamous “Squadzilla”. 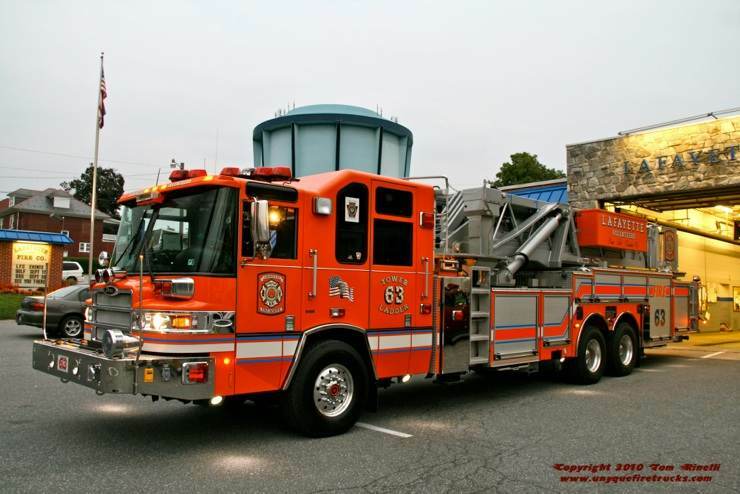 Responding first due to auto accidents/fires, rescue & haz-mat calls as well as being a mutual aid transfer engine, it features a 12 ton bumper mounted winch, 20kw hydraulic generator, a 6,000 watt light tower and 4 bottle 6,000 psi cascade system. Its’ equipment complement includes a pre-connected Amkus rescue tool system, 76 ton air bag system, Stokes basket, AED, thermal imager, RIT Pack and 30 gallons of Universal AFFF foam. In addition, it is also equipped with 1,000’ of 1 3/4” & 400’ of 2 1/2” attack lines, a high rise pack, 450’ of 3” and 1,000’ of 5” LDH supply line. 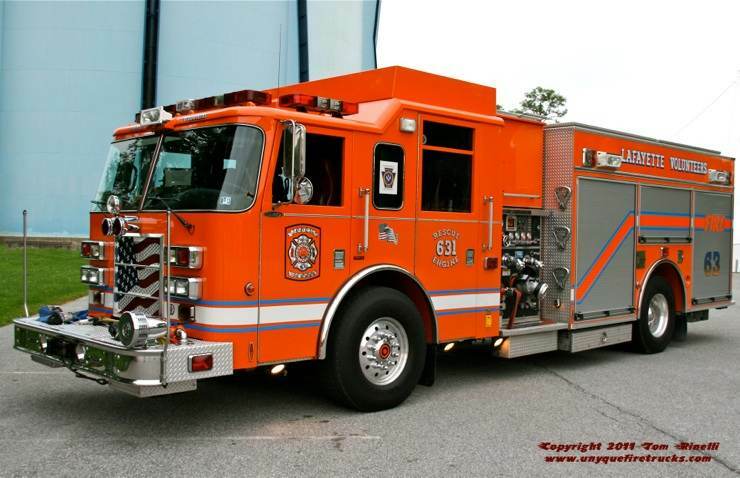 It replaced a 1991 Spartan/Saulsbury rescue engine. Responding first due as a mutual aid truck, Tower 63 is second due to structure fires, fire alarms, gas leaks as well as all special rescue calls. It is equipped with a 20kw hydraulic generator, 190’ of ground ladders, six saws (3 rotary, 3 chain), an acetylene cutting torch, 1,200’ of rescue rope & hardware, a Stokes basket, Hurst rescue tool system as well as a thermal imager, RIT Pack & an AED. 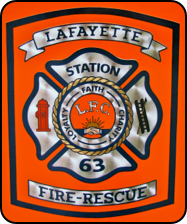 Responding countywide as part of the Lancaster County Foam Task Force, Lafayette operates Engine 6-3-3, Foam Engine 6-3-2 & Foam Trailer 63. Owned by Lancaster County & quartered/staffed by Lafayette, this 2005 MSG Industries trailer carries 510 gallons of Universal Gold AFFF & 50 gallons of high expansion foam. It is equipped with a 500 gpm aspirated foam master stream device, 300’ each of 1 3/4” & 3” hose, a 150‘ high rise foam bag and a portable high expansion foam generator. Special thanks to Deputy Chief Scott Hershey for his assistance in positioning the rigs & providing background information on the department & its’ rigs.